Talk about a truly unforgettable invitation full of texture and class. 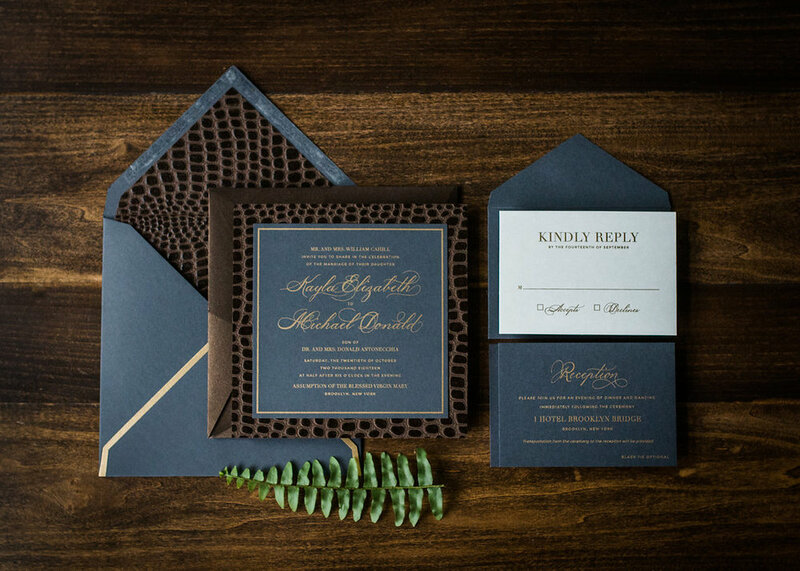 These monochromatic invitations are designed in a gray and espresso color palette, with brilliant metallic gold accents, and gorgeous croc leather*. Fitting for the couple that's not afraid to be bold, loves texture, and looking for that perfectly chic design. Shown with an optional origami pocket, adding more of a unique twist, that packages the entire suite. Our starting prices for invitations are approximately $1,800+, while the average Penn & Paperie client typically spends $2,000+. These are rough figures based on a quantity of 100. To receive a custom quote, please fill out an enquiry form by clicking the button below that says "inquire about this product". Our average starting prices for invitations are approximately $18-$20+ per suite (a suite consists of an invitation, rsvp set, mailer envelope, etc.). These figures are loosely based on a quantity of 100. There are a range of factors that can affect the pricing for invitations - like printing options, cardstocks, and the amount of enclosure cards. Knowing your budget helps us narrow down what options would work best for your project.